My mom started teaching me to cook at an early age, and one of the first desserts I learned to prepare was pineapple-upside down cake. It is one of my favorite comfort foods to this day. I’ve always followed Mom’s recipe faithfully until today, when I decided to make things a little more decadent, and hopefully, a little more delicious. Mom and I share a love for rum-flavored desserts. Rum raisin ice cream, black-bottom pie, rum cake — you get the idea. She relies on rum extract, while I prefer the 80 proof version for cooking. 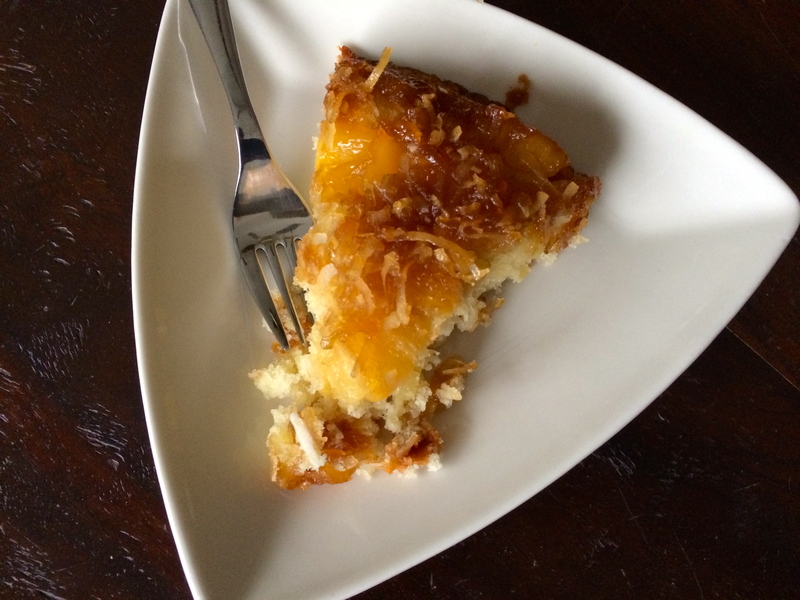 I thought a little rum and some coconut might convert our tried-and-true upside-down cake recipe to a tropical treat, and exchanging the original recipe’s vegetable shortening for real butter was a no-brainer in my upgrade strategy. It has only been in recent years that I’ve come to realize all flours are not created equal, and now King Arthur flour has become part of the recipe. One thing was consistent with family tradition- this cake bakes best in a cast-iron skillet. No mere cake pan can deliver the pineapple-butter-brown sugar topping with the same wonderful caramelized texture. Preheat the oven to 350°. Lightly grease a 10-inch cast-iron skillet with 1 tablespoon vegetable oil. Drain pineapple, reserving the juice. Add rum to the pineapple juice, and if necessary, enough water to make 2/3 cup liquid. Add 3 tablespoons of crushed pineapple to the juice. On the stove top, melt 1/4 cup butter in the prepared skillet over medium low heat, then stir in the brown sugar and the remaining crushed pineapple. Spread evenly in skillet, then place pineapple chunks in the skillet, spacing them evenly. Sprinkle with 1/2 cup of coconut. In a mixing bowl, cream 1/3 cup butter and sugar until light and fluffy. Add egg, and mix until thoroughly blended. Sift together flour, baking powder, and salt. Add the dry mixture alternately with pineapple juice mixture, mixing well after each addition. Add 1/2 cup coconut and mix thoroughly. Spoon batter over the pineapple mixture in skillet. Bake for 40-45 minutes, or until the cake tests done. While the cake is still hot, carefully turn it out of the skillet onto a serving platter. I’ve never made this cake when a little of the topping didn’t stick to the skillet, so be prepared to make a few repairs once you have plated the cake. It is best served warm, and is equally delicious on the second day after a brief microwave reheat. There’s a check mark in the “WIN” column for this experiment. 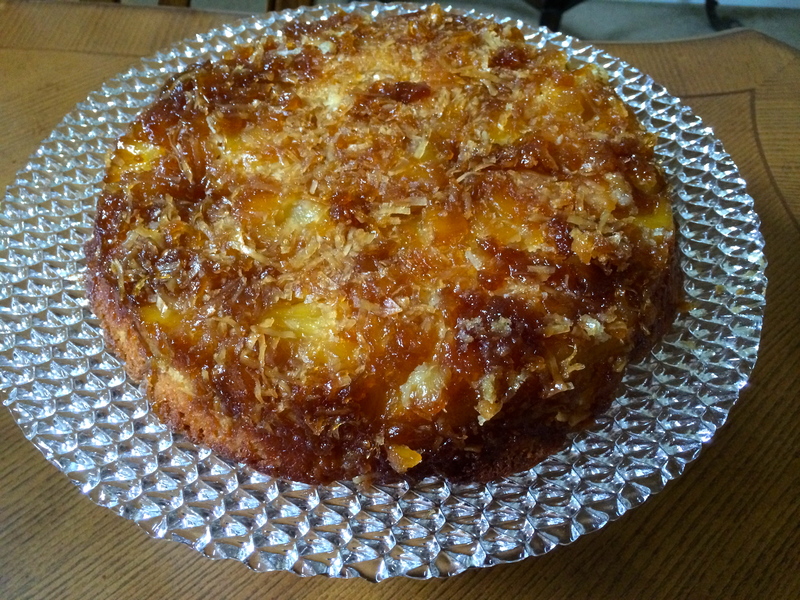 The butter and rum added more flavor depth and moistness to the cake, while the coconut in the topping and batter made it satisfyingly tropical. King Arthur Flour always plays a key role in my baking success. This American employee-owned company mills high-quality flours from 100% American-grown non-GMO wheat. 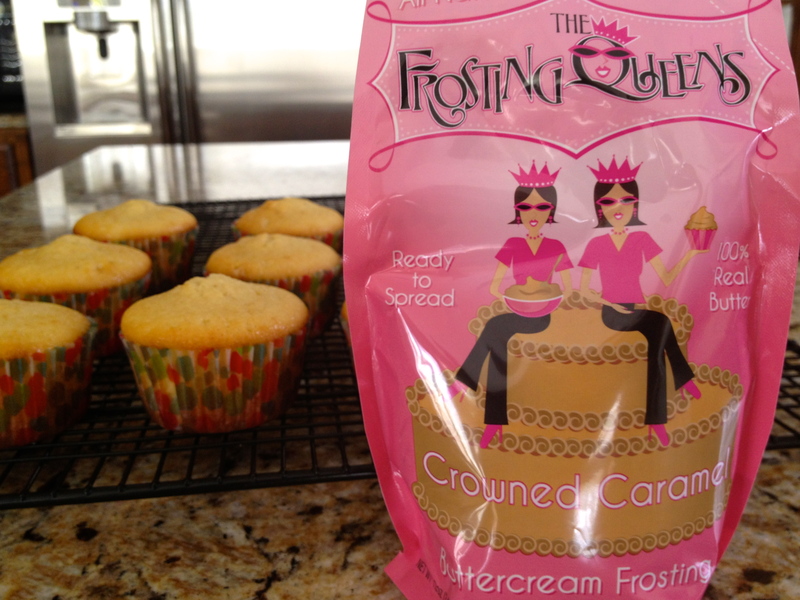 If you have been following our blog for very long, you know I use it with confidence in all my baking. King Arthur Flour’s website has become one of my regular internet stops. The company has a pretty amazing selection of baking products, utensils, and supplies at good prices. The company’s website is also a good recipe source, and after 222 years in business, they have plenty of them! 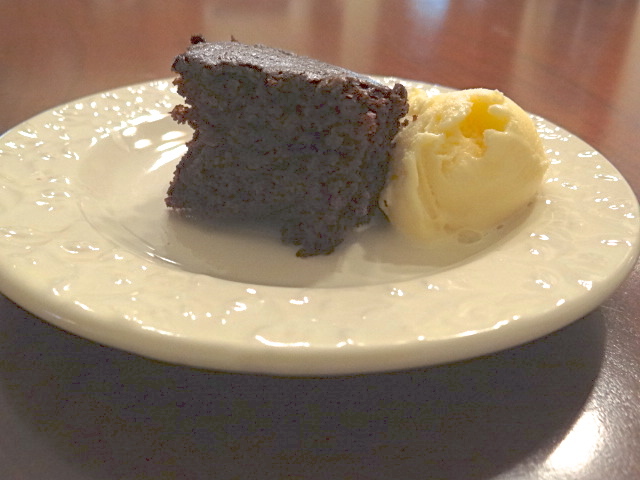 I printed a chocolate snack cake recipe several days ago, and mixed it up after dinner. My unofficial definition of “snack cake” is a quick-to-prepare cake moist and flavorful enough to be served without frosting, and this recipe showed promise of hitting that mark. The recipe dates back to an undefined “wartime”, which I’m guessing would be World War II. My grandmother told stories of using ration stamps to buy sugar and finding creative ways to cook with whatever ingredients she had available. The recipe has been one of King Arthur’s most popular over the years. It is very appealing today because it can be made with pantry supplies normally on hand, is relatively low calorie, has no cholesterol, and is low in saturated fat if made with canola oil (which I did). 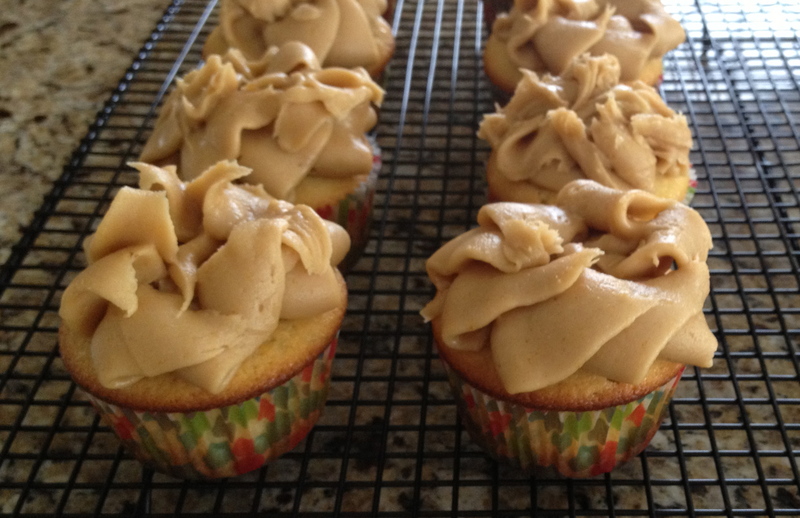 The recipe offers four different liquid options and based on your choice, the cake can be a vegan treat as well. It is called a cake-pan cake because you can mix and bake the cake in the same pan, although I elected to use a mixing bowl. Preheat oven to 350°. Measure all the dry ingredients into a mixing bowl, or a greased 8″ or 9″ cake pan. If you use an 8″ pan, it should be at least 2″ deep. (The recipe calls for a round pan, but I used a square 8″ pan.) Whisk the ingredients together thoroughly, and make three indentions. Pour the vanilla in one indention, vinegar in the second, and vegetable oil in the third. Pour the cup of cold liquid you chose directly over the other ingredients. Stir until well blended. If you mixed the ingredients in a bowl, pour into the greased pan. Bake for 30 to 35 minutes. Serve warm or at room temperature. Fair warning: the cake served warm may not come out of the pan so beautifully, but the taste will more than compensate for the appearance. The cake has a light texture; the chocolate, coffee, and rum are darkly delicious. Add a small scoop of ice cream, and you have a dessert that won’t break the calorie bank! This unassuming aluminum tray contains one of the most decadent desserts I have ever eaten. Two of them arrived on our doorstep along with two jars of toffee sauce just before Christmas, courtesy of Karen. She and I are both sticky toffee pudding fans. If you aren’t familiar with this treat, it is an extremely moist and light cake made with dates, then smothered in toffee sauce. It is as incredibly rich as it sounds. Sticky toffee pudding is a traditional English dessert that has found an enthusiastic fan base in America. The English Pudding Co. was founded in 1998 by Simon Johns, whose family is well known for its sticky toffee pudding sold in England’s Lake District. Simon spent 16 years working and training in restaurants and hotels in England, Canada, America and Asia. He has received rave reviews on his mother’s sticky toffee pudding recipe. The dessert requires a little assembly when it arrives. The toffee sauce is warmed in the microwave for just a few seconds until it is soft enough to spread over the cake in the aluminum pan. This helps keep the cake moist until it is served. I tasted the toffee sauce after it was warm, and it was a miracle any made it to the cake! YUM! The cake can then be refrigerated for four weeks or frozen for six months. (I can’t imagine any way this would last in our refrigerator for four weeks.) Serving is a snap. Just slice the cake and heat in the microwave until the cake is warm and the toffee sauce is puddled on the plate, about 20 seconds. This dessert is “scrape the plate” good. Sticky toffee pudding is traditionally served with vanilla ice cream or whipped cream, but it pretty awesome solo. The only thing that would have made it more enjoyable would have been if Karen had been here to taste it with us! There’s another pudding cake in the freezer, so maybe we can share that one–if she hurries! XO, Karen. This was an awesome treat!